Interfacing and stabilizers are typically used between two layers of fabric in apparel and accessories. Stabilizers provide structure for projects like tote bags and crafts, whereas interfacing is generally used to provide more body in apparel projects like shirt collars and facings. The heavier the weight, the more body or structure it provides. Interfacing and stabilizers are available in sew-in and fusible varieties. Interfacing is a permanent addition to craft, quilting, and apparel projects like collars, bags, and more. This will add some stiffness and body when using a fabric that needs a little reinforcement. Most kinds of interfacing are knit and are pretty stiff, but there are some woven options that have a little stretch. Knit interfacing is best for things like the waistband of a skirt because it has some give. We have a wide selection of interfacing in feather weight, and heavy weight varieties. We also carry sheer weight interfacing, which is meant to be used for clothing and decorations that utilize sheer fabrics. The actual weight per square yard can vary, but medium weight interfacing is generally about 2 oz. Depending on the type of interfacing, it may be made of different materials. Most choices are polyester, rayon, cotton, or some kind of blend. Pellon sew-in hair canvas is an exception, as it is a blend of cotton, cotton viscose, horsehair, polyester, and wool. Hair canvas interfacing is a little stronger than most, used in heavy-duty tailoring projects, like coats and jackets. Insul-fleece is another exception. 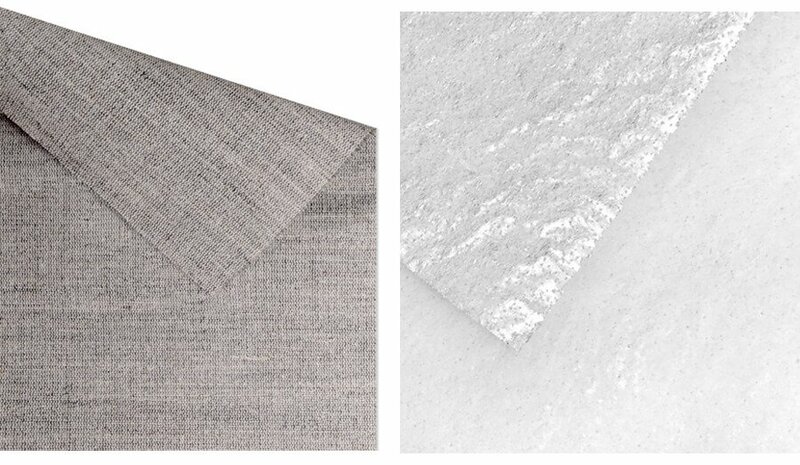 This insulated interfacing contains Metallized Mylar. Insul-fleece is great for heat sensitive applications like pot holders and table pads. A less typical interfacing we carry is seam tape, as well as a range of sizes and weights of stitch witchery. Dritz stitch witchery is used for creating seams without glue or a sewing machine. Seam tape is often used to join scraps of batting to be used for a quilt. We used stitch witchery to make this no sew valance. Stabilizer serves a somewhat similar purpose to that of interfacing. Generally speaking, stabilizer is stiffer and provides more structure. It’s not always meant to be a permanent addition to what you’re sewing. Sometimes stabilizer is used to help sew a sheer fabric or add appliques and embroidery. After sewing, the stabilizer is removed from the fabric. There are a few factors to take into account when choosing between a fusible or sew-in interfacing/stabilizer. How much use your project gets is a big factor. Fusible interfacing/stabilizers are meant to be long-lasting, but after a lot of use and washings the glue can wear down. Sew-in doesn’t have any adhesive, so this isn’t a problem. Another factor is the quality of fabric. 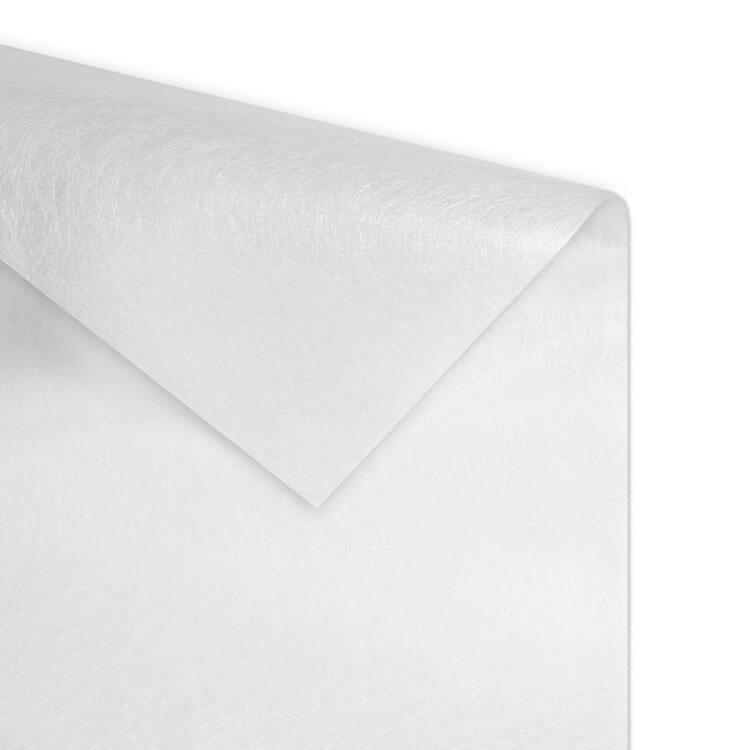 When a fusible product is used, the fabric takes on the stiffer properties of the interfacing. If you want to maintain the drape of the fabric, sew-in is better because it’s only attached at the seams. Ease of use should also be taken into account, as fusible is usually easier to work with. Click here to learn more about choosing interfacing. To attach fusible interfacing or stabilizer, place the piece fusible (bumpy) side down on the wrong side of the fabric and iron. The heat will melt the fusible side and make it sticky, attaching it to the fabric. Make sure it’s centered when ironing. It works best to hold the iron down for about 10 seconds or more, then move on to the next section. Move to the next section by picking up and putting down the iron instead of gliding it. Continue until the whole piece is attached. Pieces of fusible interfacing are usually cut to be a little smaller than the fabric on all sides. Once it’s attached, you can’t trim corners or seam allowances. Testing the interfacing/stabilizer in a scrap piece of fabric is recommended so you’ll get a better idea of whether or not you’re using the right weight. 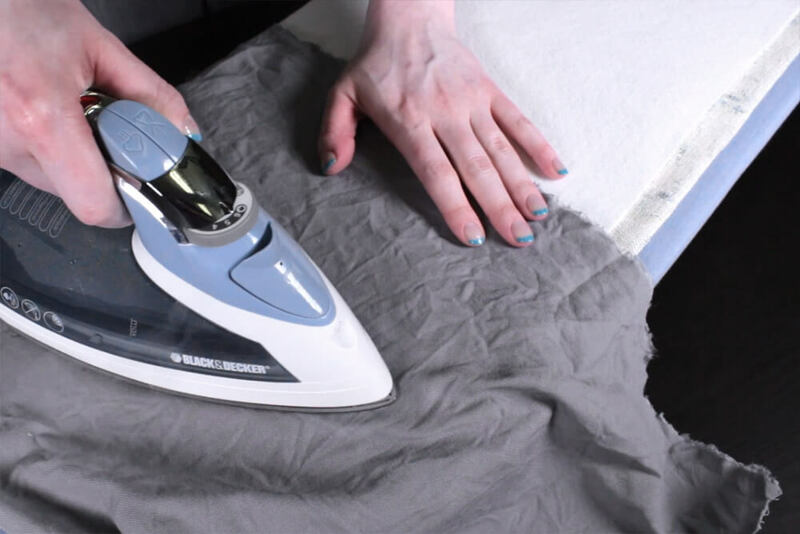 Using a pressing cloth will protect the fabric and prevent sticky residue from getting on the bottom of your iron. If you do get residue on it, you can usually peel it off after turning off the iron and letting it cool. Sometimes it’s recommended to use another press cloth to protect your ironing board, but this isn’t totally necessary. Sew-in interfacing/stabilizer is different in a couple ways. Firstly (obviously), no ironing. Cut the piece to the same size as the fabric, instead of smaller. Pin in place, but only use a few pins and put the pins in the middle instead of the seam allowance. The idea is to keep it lined up without causing any warping while sewing. When attaching, use a seam allowance that is slightly smaller than that of your project. For example, if you’re using a ½” seam allowance, use a 3/8” or smaller seam allowance for attaching the interfacing/stabilizer. After sewing, trim the seams and corners close to the stitch to reduce bulk. See our extensive selection of interfacing and stabilizers here. best to use in potholders? BEST ANSWER: Pellon #975 Insul-Fleece Sew-In Fleece is great for potholders! What should I use to back a cotton panel for hanging as art? BEST ANSWER: We'd suggest our most stiff stabilizer, Pellon #71F Peltex I Ultra Firm Fusible Stabilizer - Single Sided. Raised decorative pattern on interfacing? What purpose is it for?